Russian President Vladimir Putin has signed a law ratifying the deal establishing the BRICS New Development Bank (NDB), according to a document published on Monday on Russia's official website for legal information. The BRICS New Development Bank (NDB) was set up to challenge two major Western-led giants – the World Bank and the International Monetary Fund. NDB's key role will be to serve as a pool of currency for infrastructure projects within a group of five countries with major emerging national economies - Russia, Brazil, India, China and South Africa. According to the Russian Finance Ministry, the New Development Bank is expected to start functioning fully by the end of the year, with the headquarters slated for opening in Shanghai. The chairmanship, with a term of five years, will rotate among the members. 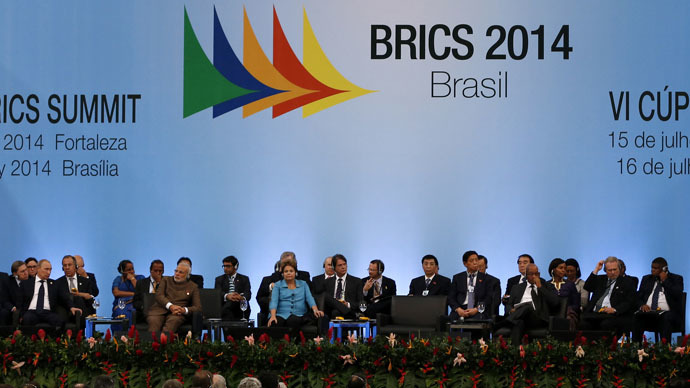 It's hoped the new bank will stamp the growing influence of the BRICS. The NDB is expected to become one of the world's key institutions, with a stated capital of $100 billion. Each of the five-member countries is expected to allocate an equal share of the $50 billion startup capital that will be expanded to $100 billion. Russia has agreed to provide $2 billion from the federal budget for the bank over the next seven years. The bank, which will be able to start lending in 2016, will be open to other countries that are members of the United Nations. The BRICS share is never to decline below 55 percent, however. The money will be used to finance development projects in the emerging economies. India will serve as the first five-year rotating president, and the first Chairman of the Board of Directors will be Brazilian. The bank was first proposed in 2012. The signing of the agreement to create the joint development bank by the heads of the five countries took place at the BRICS summit in Fortaleza, Brazil, in June 2014. The lower chamber of the Russian parliament, the State Duma, ratified the agreement on the NDB establishment last month.